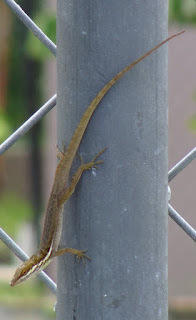 Close encounter of the third kind…of Puerto Rican grass anole! 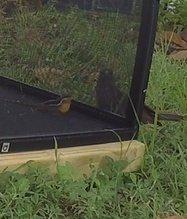 It so happens that right in my Yauco home base where I’m conducting my video trials, there are resident Anolis poncensis, also known as Ponce anoles, southern garden anoles, or el lagartijo jardinero del sur. 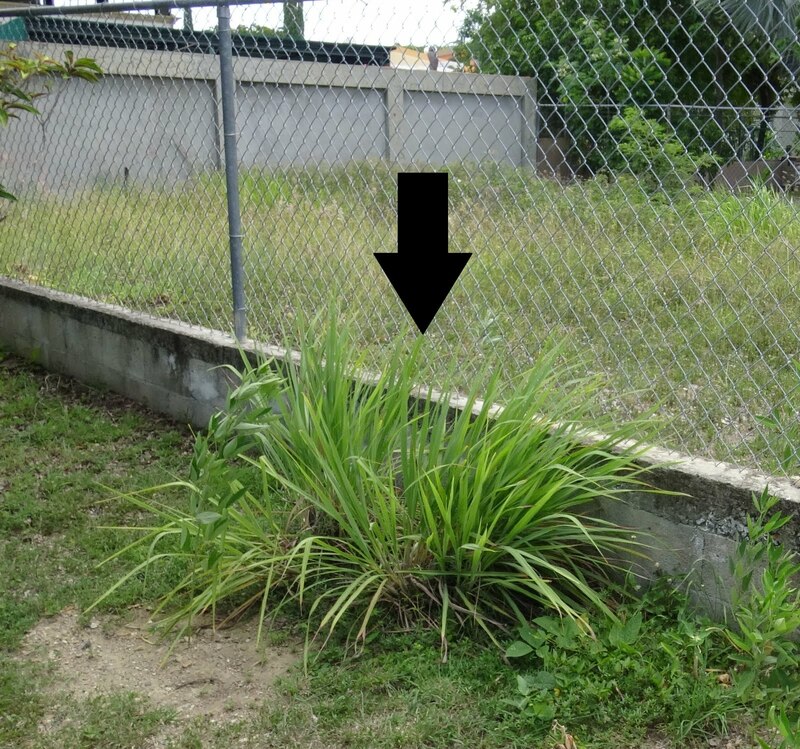 This third Puerto Rican species of grass-bush anole is found throughout much of the drier southern and southwestern coast of the island. It possesses a diminutive dewlap, making this species a bit of an oddball among anoles. Nonetheless, a lack of a “bandera” does not make it less shy to show off its display. I regularly see one male and at least one female perched within a lemon grass bush just in view of one of my enclosures, almost as if they’re pouting at a distance for not being included in my study. 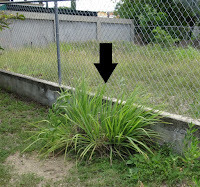 Lemongrass makes for great tea and a great home for xeric anoles. One time I approached the lemongrass too close and the male Ponce anole jumped out, climbed up the nearby fence post, and gave me a brief glimpse of his macho display. Close encounter of the “bird” kind! Puerto Rico certainly has its fair share of backyard birds. And aside from their neat calls and aesthetically-pleasing plumage, I appreciate most of them for their lack of interest in my lizards and enclosures. Of course that’s not the case with every bird. Enter the Greater Antillean grackle: a very gregarious bunch of birds and a common site in parks, popular beaches, plazas, college campuses, parking lots, and anywhere else they could find scraps of human food. The courtship of the males is particularly hilarious to watch as males puff themselves up and follow the female while fluttering their wings. They are known locally as the Mozambique or Chango. In this instance, “chango” is most appropriate. While they open to share similar tastes with humans, they also seem to enjoy fresh lizard on the side. The chango, on top of the enclosure, fails to find a way to break into the cage. I’ve had few instances of a chango approaching the enclosures while recording. The lizards freak out which in turn motivate the chango to chase after it, running and flapping laps around the enclosure as they fail to penetrate their beak through the metal mesh. They eventually give up, but only after giving the lizards a fear-motivated “Insanity” workout. On one occasion when a chango was inspecting a cage, it was nearly tackled by another common bird, the Pearly-eyed Thrasher or Zorzal pardo. As the chango tried to hopelessly nab a lizard, the zorzal pardo was trying to chase it off so it too could take a stab at the lizards. This Anolis krugi male shows off his dewlap as he has a brief stare-down this pearly-eyed thrasher.